Bikes, scooters, wagons, and more! open from December 9th - December 23rd. 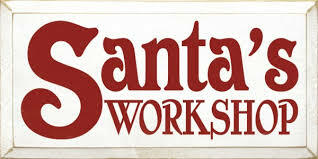 Santa's workshop is the workshop where Santa Claus is said to make the toys and presents given out at Christmas. In Santa Claus mythology, the "workshop" is a sprawling commune located at the Northpole. In addition to housing the factory where toys are either manufactured or distributed by the elves, the complex also houses the residence of Santa Claus, his wife and all of the reindeer. And now, SANTA'S WORKSHOP has a remote location held at Beverly United Methodist Church! Gently Used Toys are no longer being sent to the Island of Misfit Toys, but coming to Santa's Workshop in Beverly! hoping to find new owners - FREE or a freewill donation! MORE BIKE, TOYS, COMING DAILY!!! or you can call to donate!